Frank Catalfumo, now 90-and-a-half years old, opened F&C Shoes in 1945, a shoe repair store in the Bensonhurst section of Brooklyn. During the past 70+ years, everything around Frank has changed. Prices have gone up; neighboring stores have come and gone, probably many times over. But one thing has remained the same. Frank "keeps moving forward," coming to work five days a week and bringing worn souls back to life. 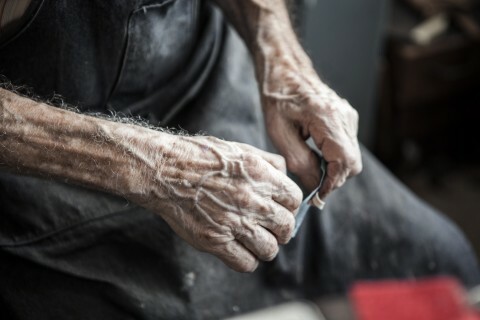 His hands tell the story. You can get to know Frank with the short film above and this accompanying photo essay, both created by filmmaker Dustin Cohen. The Shoemaker is the latest installment in Cohen's film series called "Made in Brooklyn." Previous installments include The Violin Maker, The Watchmaker, and The Jewelry Maker. Whistled language is a rare form of communication that can be mostly found in locations with isolating features such as scattered settlements or mountainous terrain. This documentary above shows how Dr. Mark Sicoli, Assistant Professor of Linguistics at Georgetown University, conducts field studies among speakers of a Chinantec language, who live in the mountainous region of northern Oaxaca in Mexico. The Summer Institute of Linguistics in Mexico has recorded and transcribed a whistled conversation in Sochiapam Chinantec between two men in different fields. The result can be seen and heard here. The most thoroughly-researched whistled language however is Silbo Gomero, the language of the island of La Gomera (Canary Islands). In 2009, it was inscribed on the Representative List of the Intangible Cultural Heritage of Humanity. The UNESCO website has a good description of this whistled language with photos and a video. Having almost died out, the language is now taught once more in schools. Jimi Hendrix's 1968 song "Voodoo Chile" is already a classic. But it becomes all the more so when you see it performed by Luna Lee on a Gayageum, a traditional Korean stringed instrument. The first Gayageum dates back to the 6th century. If you like seeing western rock standards reimagined within an Asian aesthetic, then you won't want to miss: The Talking Heads’ “This Must Be the Place (Naive Melody)” Performed on Traditional Chinese Instruments. Pa, the horses got out of the barn again, and danged if they don't appear to have passed through the Museum of Natural History on their way to Grand Central. The otherworldly beasts are occupying the famed New York City transit hub's Vanderbilt Hall this week as Heard NYC, a collaboration between artist Nick Cave and Creative Time, which commissions work for presentation in public spaces. For his latest feat, Cave took his Soundsuits---wearable sculptures with an organic sonic component---in a direction both equine and ethnographic. Sixty dancers from the Ailey School bring the herd of thirty to life, stamping raffia-sheathed legs and tossing black heads augmented with festive Rajasthani embroidery. Their twice daily performances occur during off-peak hours. Chance interactions with midday travelers are one thing, but an unscripted encounter with an exhausted commuter rushing for the Metro North bar car? That's a horse of a different color, my friend. They've a far better likelihood of crossing paths with your average, unsuspecting Joe than actress Tilda Swinton, a-slumber in her glass coffin at the nearby Museum of Modern Art (see below), but as of yet, the monsters are not viewed as constituting a major security threat. He's nine years old. And they call him "The Philosopher." Give the clip a few seconds and you will see exactly why. The Philosopher tackles the biggest questions: Why are we on earth? What's our place in the universe? Is there life elsewhere in that universe, or, for that matter, do we live in a multiverse? What's the meaning of life? And, finally, might our life be predestined -- all scripted out for us in advance? Watch it, and then ask yourself: Do you know many adults who can reel off better answers? Doubt you will say yes. Genius -- these days, we bandy the term about ever so freely. Everyone's a genius, including this 2-year-old wielding a pair of nail clippers. Then, Neil deGrasse Tyson comes along and reminds us what a genius really looks like. Asked "Who is the Greatest Physicist in History," he responds, Isaac Newton, without any hesitation. Newton discovered the laws of optics, proving that white light is actually made up of colors, the colors of the rainbow. He mapped out his three laws of motion and the universal laws of gravitation. And then he invented differential and integral calculus to explain why planets orbit in an elliptical fashion. Now get ready for the kicker. This all happened before Newtown turned 26. That, my friends, is what genius looks like. This clip comes from an extended Big Think interview, which you can watch in full here. Just when it seemed, after decades of scholarship, criticism, and commentary on the life’s work of William Faulkner, that there was nothing more to say, along comes The New York Times with a report of an early unpublished story and a batch of letters to his wife Estelle, recently uncovered in a box found in the barn at the Faulkner family farm in Charlottesville, Virginia. 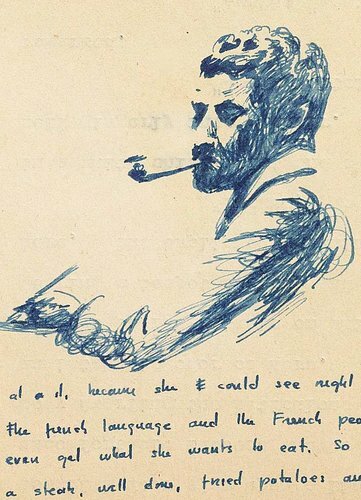 The new work, discovered last year, will go on auction at Sotheby’s this June, along with hand-corrected manuscripts, a hand-bound poetry book, Faulkner’s 1949 Nobel prize medal and diploma, and a handwritten draft of his acceptance speech. 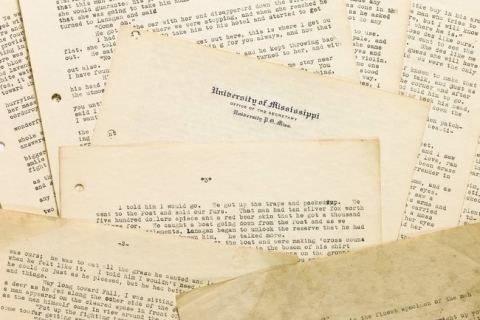 The image at the top shows the unpublished story---about a fur trapper’s trip to the city---typed on the back of University of Mississippi letterhead, where Faulkner was a student for three semesters between 1919 and 1920.